TT #62 Paint or Restripe? One of the decisions older Bounder owners face as their Bounder ages is "Should I replace the vinyl accent stripes or should I consider repainting it?" The challenges of stripe replacement involves removing the existing stripes and then obtaining the original equipment accent stripes. The stripe versus paint decision comes down to making a decision about the overall condition of the Bounder and how well it meets your current and future requirements. If it is in good condition and it will meet your needs for the next few years then upgrading the exterior maybe worthwhile. How much to do and how much it costs will pale in relation to what a new coach will cost. Obviously Fleetwood would love to see you buy a new coach and for those with the ability to do so, this option may be the best choice. One can not overlook the fact that there is a lot of new technology found in the newer coaches that was not available in earlier models. Carrying capacity and more efficient powertrains together with larger tires and storage are some of the advantages of newer models. The interior features and options will make any existing Bounder owner excited. Check out your local Bounder dealer before making a decision to upgrade your existing coach. In discussions with those familiar with these things, I am told that the original equipment manufacturer will frequently order a small quantity of accent stripes in addition to those needed for the production and keep them in stock for warranty replacement and parts sales later on. These stripes deteriorate even when not installed and are often much less flexible and durable than newly produced stripes. The useful life of uninstalled graphics can be as little as two years. On coaches 10 to 15 years old, the stripes in inventory may have already passed their usable life. You can order the accent stripes and graphics from Fleetwood at 1-800-322-8216. Provide your Fleetwood Identification Number (F.I.N.) found on the label beside the driver's side exterior mirror. You can ask to try to determine how old the stripes are however it is a guess at best. An alternative is to call a company that custom makes the stripes on an as-needed basis. A potential supplier is: RV Stripes & Graphics Inc.based in Mesa, AZ. Steve Zacher is a co-owner and he has been supplying vinyl graphics since 1993. His contact information is 480-984-7939 orsteve@rvsg.com. It is a large task to remove the existing graphics, clean off the adhesive and then re-install the new graphics. Use a good scraper and a solvent together with a heat gun or electric heated scraper Tackle a small area and learn how to use the tools effectively. Old adhesive can be removed with a product called Goof Off, a strong chemical that must be used with care. Check with your graphics supplier for their advice if you are going to do this work yourself. The second way to improve the look of an aging Bounder is to have it repainted. 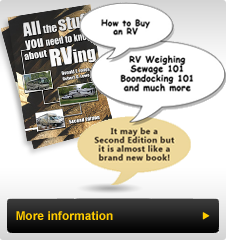 My research has led me to check with three RV paint companies that know how to do this work in a cost-effective way. On my 2002 Bounder 39Z the lower metal portion was painted as it was delivered from the factory. This section of the coach was always easy to wash, wax and maintain. The upper portion was gel coated fiberglass with the vinyl stripes applied onto it. Over time the gel coat began to change color and yellow from the white that it was when new. While it had a great shine, the upper portion required ever increasing time to clean because the coating was deteriorating and holding dirt on its surface. This left a smudged look when looking at the body up close. Those familiar with this type of body suggested that the surface was breaking down and that without a painted finish it would continue to deteriorate. While painting the coach was a distinct option the decision to do so contains three facets. Do you choose to match the existing color scheme and look in a paint finish? Do you paint it in a more modern paint style, typical of newer Bounders? Is there an economic justification to painting the coach? The last question's answer is the simplest one to answer. While the cost of a complete paint job is usually less than the sales tax paid on a new coach, the money paid will not come back on resale. The complete paint will make the coach easier to sell, however it will still be considered (for instance) a 2002 Bounder. Full body painting of an older coach is done more to please the current owner than for economic reasons. The vast majority of RV's that are painted are painted to reflect current RV paint styles. As someone said complete body paint updates the coach to a "five year old look" reflecting the fact that the majority of new Type A coaches built within the past five years are finished in a full body paint. The repainting includes removal of all vinyl stripes and graphics which are sanded off and all surface imperfections can be repaired at the same time. If you want to add the Bounder logos for coach identification, these are available from Fleetwood parts at the number noted above. The quotations I received for repainting were in the under $10,000 to $15,000 range. The shops that I checked out were both located in the Elkhart, IN area and were FMCA commercial members. They were: Precision Painting Inc. (www.PrecisionPaintingRv.com 866-909-4473 and Mike's Custom Painting Inc.www.mikescustompaintinginc.com 574-546- 2161. I toured both shops and saw work being done and can say with certainty that these companies were doing a booming business and delivered a good quality job. All caulking is removed (and replaced after painting), windows were resealed, and any upgrading to the body hardware (new awnings) can be completed at the same time. Covering the front panel with a 3M or Diamond shield protection material is also an option many select. Another source which I checked out online is www.xtremegraphics.net however I did not visit their facility. Good luck with the decision whichever way you chose to go.